The psoas muscle has gained a great deal of attention in recent years. Wellness expert and holistic doctor Christiane Northrup calls it “the most important muscle in your body.” I became intimate with my own psoas muscle a couple of years ago, after developing chronic lower back pain. Here’s how to incorporate the psoas lunge into your own practice. I find it very helpful to keep in mind the phrase “the opposite of sitting” when I’m practicing or teaching the psoas lunge. Picture yourself seated in a typical chair. Notice that your hips are in flexion, with your knees bent toward your belly. Chances are that your back is resting against the back of the chair (which means the chair is doing the work of your core muscles). Your shoulders may be hunched forward slightly. Sitting has been called the new smoking, and the negative outcomes of too many hours spent in this position are countless. 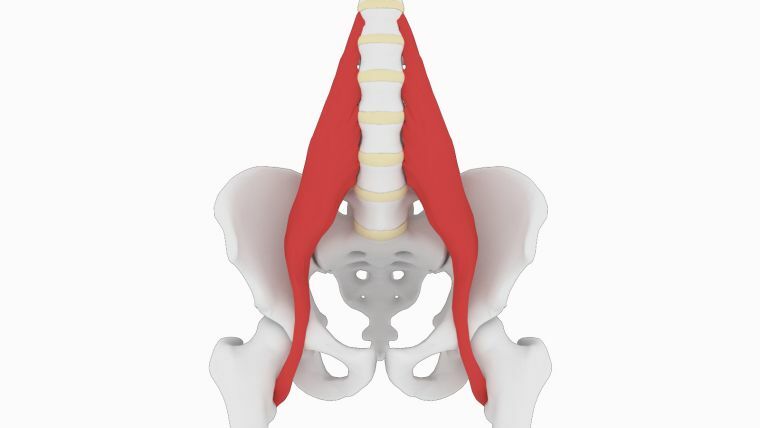 Since the psoas muscle connects the hips to the spine (it’s actually the only muscle that connects the spine to the legs), it becomes short, weak, and tight from too much sitting. Recognizing the negative impact of sitting inspires the question: What does the opposite of sitting look like? One answer: the psoas lunge. As a result of an initial visit to an orthopedist, subsequent physical therapy, my own anatomy detective work, and various yoga trainings, I learned that I am hypermobile—with loosely set hips, as confirmed by an X-ray. Overstretching had pushed my body past its natural edge. The experts I spoke to believed that to be the source of my back pain, and they suggested I develop a greater focus on strength rather than flexibility in my practice. That’s what makes the psoas lunge so powerful: It’s a dynamic stretch in which the muscle is engaged and active (versus passive). With two blocks handy at the top of your mat (on the lowest level to start), come to your hands and knees in tabletop position. Step your right foot between your hands. Shift your left knee back so that your weight is slightly above the kneecap rather than directly on the center of it. You’ll immediately notice a nice opening in the front of the left hip here in low lunge (anjaneyasana). The toes of your left foot should be pointed, the top of the foot resting on the ground. Place a block beneath each hand. Depending on the length of your arms, you may want to use the medium or taller height of the block, with the goal of making sure your hands feel steady and supported. Bringing hands onto blocks also keeps the heart open and prevents the back from rounding. Bring your gaze toward the floor and slightly forward so that the back of your neck is in its natural alignment. Avoid either pressing the chin to the chest or lifting it toward the sky. Notice your shoulders: If they’ve crept up toward your ears, allow them to soften. Take a breath here. To come into the psoas lunge, press evenly into the top of your left foot, making sure not to let it collapse either left or right. This will lift your left knee off the ground. Your hands remain on the blocks. Stay here for three to five breaths. Silently saying “the opposite of sitting” can help you visualize the anatomical work being done in this pose. You might wish to draw your breath and attention to your deep core, envisioning your psoas muscle being both stretched and strengthened in this posture. On an exhale, allow the left knee to return to the floor. Return to your starting point on hands and knees. Then repeat on the opposite side by stepping your left foot forward between your hands, drawing the right knee back, and pressing into the top of the right foot, with toes pointed. As with any yoga posture, the use of your breath can greatly complement the psoas lunge. Since the psoas is connected to the diaphragm through ligaments and fascia, making sure that you are using the full capacity of your breath, with deep belly breathing (also called diaphragmatic breathing), will allow you to harness the maximum benefit of this posture. The breath works the lunge from the inside out, creating powerful shifts in your deep core. Writer Annie Dillard once famously said, “How we spend our days is, in fact, how we spend our lives.” Be mindful that spending most hours of your day in a hunched, seated position cannot be balanced by an hour on the mat, although it’s certainly a step in the right direction. Start by noticing how you sit, and how often. When sitting, don’t lean against the back of the chair—instead allowing your core muscles to do the work for which they were designed. Take regular walking breaks, try a standing desk, or sit up on a yoga block while seated in a chair (another one of Michaelle’s great recommendations for decreasing hip flexion). Sitting on an exercise ball can also be a good option, if the ball allows your hips to come higher than your knees—as that’s the indicator of the quality of your seated position. Be mindful of keeping both legs forward, and consider how tucking or crossing one leg could lead to long-term imbalances. Added to your practice of the powerful psoas lunge, these various modifications to your daily habits may gradually have their effect on your strength, your comfort, and your confidence. And finally, you may find that spending your days differently will change how you spend your life.